Should population policy be cyclical or should it represent long-term planning which attempts to assess how many people this dry continent can reasonably sustain notwithstanding our duties to care for poorer people around the World? In my view, the latter conception is population policy is more valid. We have to assess the carrying capacity of this part of the planet and scale our economic activities accordingly. While environmental concerns have to be paramount in determining population policy, labour market issues are also not unimportant. You can see that I have some sympathy for the view that manufactured labour force growth (via net migration) will exacerbate the cyclical position of the local unemployed. There has been a long debate as to whether immigration promotes a deterioration in the unemployment rate. Several studies have examined this issue. It has been argued that the importation of skilled labour during a recession increases structural unemployment. But whether immigration affects the aggregate unemployment rate is unresolved. The increases in labour supply have to be assessed against the possible demand-side effects. Output and employment growth are increased by the stimulus to aggregate demand for final consumption goods and services, public capital works spending, and business investment (provided in part by the migrants themselves). Whether migrants add enough to aggregate demand to ensure the labour-force growth they promote is absorbed is moot. However, we can readily measure the increases in labour supply for different net migration assumptions by doing a little arithmetic. The arithmetic is derived from aggregate macroeconomic relationships using the so-called Okun’s Law, named after the doyen of applied economics, US economist, the late Arthur Okun. Accordingly, the link between the GDP growth, labour productivity growth, and labour-force growth is provided by the unemployment rate. Thus, if GDP growth (increasing demand for labour) is greater than the sum of labour productivity (reducing labour requirements) and labour-force growth (with participation rates constant), the unemployment rate falls. However, if the sum of labour-force growth and labour productivity growth outstrips GDP growth, then the unemployment rate rises. First, what does the labour force data look like? The following diagram shows the cyclical nature of annual labour force growth since 1978 in Australia. The red line is the average annual growth rate since 1978 which has been 1.86 per cent per annum. Labour force growth has averaged 2.1 per cent per annum since February 2006. In the last year this has slowed to 1.82 per cent. With the meltdown in superannuation funds and the record levels of debt that are being held in the household sector it is possible that the cyclical downturn in participation rates (and hence labour force growth) will not be as large in this downturn. This would mean that the so-called added worker effect (extra family members seeking work to prop up family income) outweighs the so-called discouraged worker effect (workers giving up job search because of lack of vacancies). What impact will the immigration slow down have? If in the last year, the labour force was reduced by 50,000 workers so that in February 2009 the labour force was 50,000 smaller than it actually is then the growth rate would drop to about 1.3 per cent over the last 12 months. If net migration was cut to zero then the labour force growth rate would drop to around 0.9 per cent per annum. So 20,000 less workers will have only a small percentage point impact in the labour force growth rate. So what is the impact on a slowing labour force growth at a time when employment growth is falling? The Okun framework allows us to make predictions about changes in the unemployment rate given the rate of growth of GDP. Simply stated, labour productivity growth reduces the amount of labour required for each unit of output, while labour-force growth increases the number of jobs that have to be created if unemployment is to remain unchanged. So both growth rates place upward pressure on the unemployment rate. If GDP growth is strong enough, the economy can absorb the labour supply and labour productivity growth. For the unemployment rate to be constant, real GDP growth has to equal the sum of labour-force growth and labour productivity growth. We can call this the required rate of GDP growth. Any better will lead to a falling unemployment rate, while any deficiencies in the required rate will see the unemployment rate rising. The following table summarises the growth aggregates (taken from ABS Labour Force and National Accounts data). I have maintained the labour force projections which are derived from ABS data taking into account three assumptions about annual net migration: (a) zero; (b) 50,000; and (c) 100,000. I made two assumptions about trend productivity growth: (a) 1.5 per cent per annum; and (b) 1.0 per cent per annum. These assumptions are fairly modest but if the recession gets bad productivity growth could flat line for a while. But at present the true trend productivity growth will be somewhere around the range assumed. It is notoriously difficult to calculate accurately. You can see that reducing the labour force by 50,000 over the next 12 months has the effect of reducing the growth rate required to keep the unemployment rate at its February level of 5.2 per cent. Given that GDP won’t go near the required growth rate, the way to think about this is that the rise in unemployment will be less. On the face of it that is a good thing. But read my final assessment after the analysis. The following table shows what might happen to the unemployment rate over the coming 12 months under various GDP growth rate assumptions. I have assumed the current zero growth in GDP and then a mild recession over the next 12 months (-0.5 per cent growth). 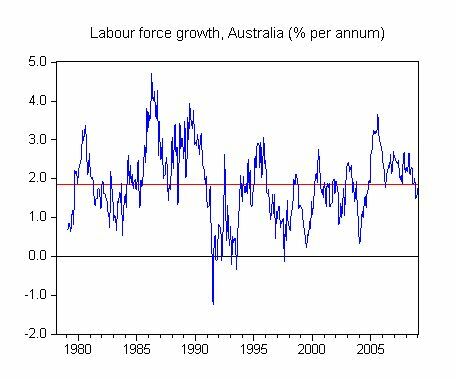 I have maintained the labour force projections which are derived from ABS data and made three assumptions about trend productivity growth: (a) 1.5 per cent per annum; (b) 1.0 per cent per annum; and (c) 0.5 per cent per annum. All three assumptions are fairly modest, and true trend productivity growth will be somewhere around the range captured. What you see is the unemployment (currently 5.2 per cent) will still probably get in the upper 7 per cent range even with a cut in net migration of 50,000. If we cut net migration to zero over the next 12 months, the unemployment rate would rise to around 7.5 per cent or thereabouts. We have to realise the GDP assumptions are fairly optimistic given what is happening in the World economy. For every 0.5 per cent that GDP growth drops you can add that to the unemployment rate. Some economists are already saying that as migrants boost construction (via housing) and retail trade (by eating) that a cut back now could actually worsen aggregate demand. At least these economists are recognising that employment is a function of aggregate demand and not wage levels. I have more or less taken conservative (eek! just the word is difficult to type!) assumptions to GDP growth and I doubt that cutting net migration by 20,000 will push GDP growth outside the assumptions I have made. One of the problems of maintaining relatively strong net migration rates (which as you can see above amount to perhaps around 50 per cent of the actual labour force growth) is that it hampers the absorption of the long-term unemployed back into work. Entrenched unemployment is a terrible disadvantage in the early growth phase. The economy will limp forward for some years after the worst of it has passed. Employment growth is typically very slow and unemployment continues to rise even after the GDP trough has passed. Also underemployment levels will be very high and represent an hours buffer that employers use before they even think about hiring anyone new. Many of those who were made jobless become locked into long-term unemployment and their job skills atrophy. As the economy starts growing again, the new entrants to the labour market – the school leavers and the skilled migrants – look more attractive to employers than the entrenched long-term unemployed. There is a large body of research literature (including my own work) which ratifies this point. The problem then is that it is very difficult for this level of disadvantage to be eliminated. Look at the second table to see how high GDP has to be under reasonable assumptions to push the unemployment rate down to true full employment (2 per cent). Virtually impossible unless there is direct public sector job creation that offers anyone a public works job at a minimum wage. This is one of the reasons I have been a long-term (more than 30 years) advocate of employment guarantees. The other advantage is that within a Job Guarantee, training mechanisms can be developed to ensure that the unemployed are equipped with skills that will benefit them in the growth phase as the private economy resumes hiring. The impact of high net skilled migration rates may not be to push the unemployment rate up by that much (as you can see in the tables). But it definitely locks in the low-skilled unemployed to extended spells of long-term unemployment and skill atrophy. Then the neo-liberal persuasion sees this long-term unemployment and punishes the victims – the unemployed. It makes no sense to have high levels of skilled migration year in year out if you have over a million Australians unemployed and/or underemployed in various states of low-skill. So while I think population policy should be part of a long-term planning process aiming to achieve environmental sustainability I include, unlike most economists, full employment in that conceptual structure. Social sustainability should be part of the overall aims. In that sense, I would not have been running such large net migration intakes for as long as we have been. I would not just cut now … I would have cut earlier and provided work for all the underutilised labour and used this direct job creation to ensure our skills development matched our needs.